Achieving a stable balance of power requires that the countries concerned develop the commitment to overcome significant obstacles. The magnitude and scope of relative military and economic strength between the major powers of the region are decisive in determining the pace, scale, and intensity of security competitions. Delaying or futilely pursuing either Chinese or American predominance will put the region at greater risk. The most stable and preferable outcome would involve major changes to volatile regional hotspots, whereas a more modest vision would be more feasible albeit less stable. Both versions of such a balance would entail some common elements. These include: mutual denial force postures and military doctrines including confidence-building measures, voluntary arms limitations, and other steps; limited freedom-of-navigation operations to verify the regional balance and assert international law; and a strengthened but limited U.S.-Japan security relationship. Balance of power arrangements can and do emerge naturally but must be deliberately calibrated and adjusted via a process of understandings to become stable. To reach such understanding, it will be necessary to overcome the inertia of large, complex governments and both sides’ cultural hubris and bureaucratic and political biases. In other respects, a more durable balance would require more sweeping regional changes than its less preferable but more achievable alternative. A highly stable balance would necessitate substantial progress on several security hotspots, including the creation of a unified, largely nonaligned Korean Peninsula, a demilitarized Taiwan Strait, and militarily limited, jointly developed East and South China Seas. It would also encompass a more open economic environment characterized by an inclusive, region-wide trade and investment agreement. 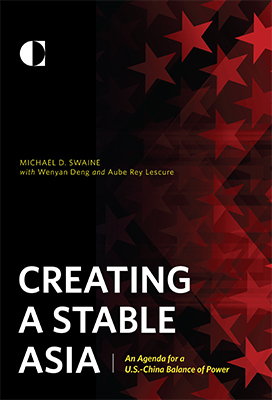 A more attainable though less stable balance instead would involve joint efforts to sustain a regional free trade and investment system short of a comprehensive regional trade agreement, as well as shared understandings regarding potential crisis contingencies on the Korean Peninsula and Taiwan. Washington and Beijing must conduct a serious, comprehensive, probability-based internal assessment of long-term regional economic, military, and political trends. On the U.S. side, the deliberate pursuit of a balance would start by clearly understanding continued American strengths in Asia, as well as the difficulties and dangers involved in achieving a stable balance. It does not require Washington to make deals with Beijing from a position of weakness—in fact, it necessitates effectively using America’s substantial military and economic power. Initial discussions with Beijing should aim to ultimately create a larger set of understandings about long-term regional security and its requirements. U.S. officials should convey willingness to consider broader mutual policy adjustments involving confidence-building measures, crisis management mechanisms, and surveillance activities near China if sufficient progress is made. Washington must consult with regional allies and friends at every step in this process. Areas of focus should include gaining acceptance of a strengthened but limited U.S.-Japan alliance, obtaining South Korean approval of the transition to a stable balance, and reaching agreement on the most optimal long-term status for the Korean Peninsula. Washington should have detailed discussions with allies and China about mutual limits on the types and numbers of their offensive weapons systems. China needs to agree to similar types of capabilities and limits, as well as specific demilitarization assurances provided as part of future agreements reached with regard to Taiwan and maritime territorial disputes. The difficulties of transitioning to a mutual denial force posture (including verification, definitions, bureaucratic problems, and ally coordination) make it vital that early consultations are successful. The United States, China, and other regional economies must strengthen their domestic economic growth and deepen their commitments to free trade. Successful long-term integration will depend on getting Beijing and Washington to join a common trade architecture, creating an eventual region-wide free-trade agreement, and conducting more active and focused U.S. economic diplomacy. In the Pacific region, only USA is upholding its predominance in the region. China is not seeking predominance. China is seeking the freedom of dealing peacefully with mutual trust and respect with the nations around. The relative shrinkage of political, economic and military power gaps between America and China has heightened the anxiety of America of being endangered by China's rise. To avoid destructive confrontation resulting from misinterpretion of the shrinking gaps requires mutual trust, repect and understanding. Frequent official information exchange and meeting to discuss relevant issues on equal footing are needed. The Taiwan government has to realized that it has been part of China and cannot be independent. The UNCLOS must be applied to South China Sea and not any other unilateral laws or proclamations. Any treaty for the region must be inclusive. not exclusive and not confrontational..